Some quiet thoughts : Reflections: STRONGER - PART 5| HOW DO WE FIGHT? 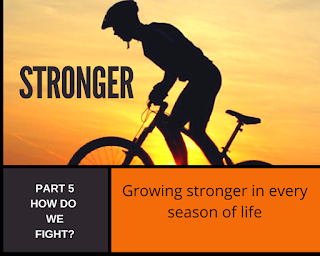 STRONGER - PART 5| HOW DO WE FIGHT? I came across a book early this year by Havilah Cunnington titled “Stronger than the Struggle”. I strongly recommend you read it. Much of what I am blogging here is from that book and what I did with a ladies group called Coffee Chats. If you find this useful, please feel free to use this material in a study group you might be leading. The blogs in this series are reflections and a summary of what I got from this fantastic book that I recommend you to buy. Before we go any further, I just want to say the whole of our life is not a battle. It is not meant to be that way. That was not what Jesus had in mind when he said He has come to give us life in abundance. He wants us to have righteousness, peace, and joy in the Holy Spirit. He wants to give it us what no eye has seen nor ear has heard, he wants us to enjoy all the treasures of heaven. Victorious living is a part of our journey with God. However, we all go through seasons of struggle. Trial and troubles cannot be your lifestyle. If that is the case I recommend that you talk to someone who will be able to help you discern where the source of the trouble is. So what tools do we have? One tool that translates across all barriers of time, geography, culture, age, and experience is TRUTH. God’s truth interpreted properly. Jesus used it to fight the devil in the wilderness. Though our enemy is defeated, we still need to know how to deal with him. Paul in Eph 6:17 onwards teaches how to fight. 2) REHMA is a specific word of the Spirit for a specific situation. You need both. You cannot have Rehma if you do not know the logos. When we are fighting the enemy we need both. Rehma the quickened “now” word which is a word for a particular situation at that moment. When I am in financial trouble the word I call back to mind is not to say “ Love the Lord your God…” good as that might be. I need to call to mind verses that speak of God’s provision like “my God shall supply all my needs”. In order for you to be able to this, you need to be filled with the Word of God, worship, listen to an uplifting message, Feed your spirit well so when you are in a battle you know which dagger to pull out and not just your favourite scripture. The devil wants us to think that we are fighting for victory, which is not true. Jesus has already won the victory for us. One of the things the devil is good at is taking a legitimate need and trying to get us to satisfy that need through illegitimate ways. Remember you can pick your sins but you don’t get to pick the consequences. Sometimes we can invite the enemy to play havoc in our lives when we compromise our conscience, when new get into relationships we should not, be in places that we need to avoid, watch stuff that we should be deleting etc. When we do not live out our calling we can end up on balconies that can ruin our lives like it did to David. We need to get off the balcony and get into the battlefield and get after our destiny. This does not need anyone to preach to you, prophecy or pray for you. You have to take personal responsibility and live out the Word of God. This is how we get to living an abundant life. The more we focus on the right things the less energy will be spent on battling. Will all battles cease? No. We will learn to fight better, stronger and swifter because we now know how to recognize his fingerprints. When God is taking us to new levels, we have to fight new devils. The increased measure will be met will greater resistance. Satan does not mind passive Christians. Attacks can often mean that we are doing something right and we have to stand or take ground. There is no neutral ground. Whenever God is pushing us to higher ground there is a battle to take ground just like Joshua in the promised land. It did not come without a fight. The Promised Land as the name suggests came with a promise – that it would be theirs. They just needed to fight the enemy and live uncompromised lives. So Struggles can strengthen us or knock us out. Courage to fight happens in community and not in isolation. It is ok to ask for help. We are called to bear each other’s burdens. One key in Spiritual warfare is obedience and endurance. If God is pointing out a thought pattern, or behavior or lifestyle choice that has got you stuck and you find that you are not winning your battles, you need to do a heart check. Is there something you are stubborn about and unwilling to change it? You need to embrace the disciple and get unstuck. STRONGER PART 6 | Conclusion.